Hello lovelies! 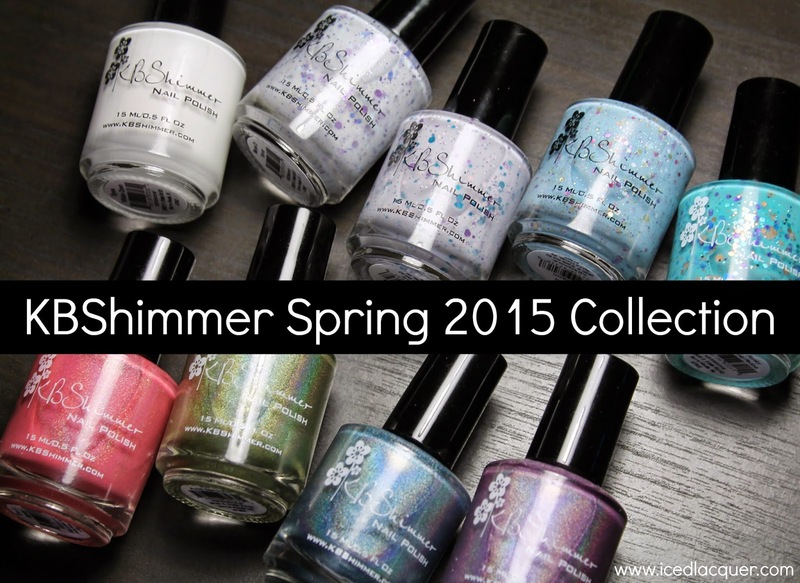 Today I have most of the upcoming KBShimmer Spring 2015 collection to share with you. 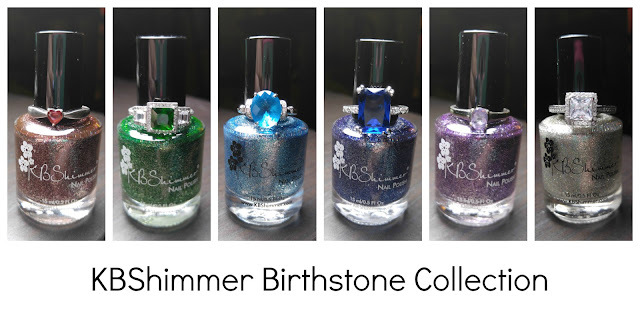 I've been holding onto these babies for a while, so I'm excited to finally be able to show you my swatches and share my review of the collection. Let's do it! "Blush Money" - A coral-y pink scattered holographic with tiny gold flakes. I used four thin coats plus top coat to cover all the visible nail line, but I think you could do three thicker coats. "Iris and Sprouts" - A pale green linear holographic. I think this one has the strongest linear effect of them all! I used three coats plus top coat. "Blue-d Lines" - A medium blue linear holographic. This one is a touch more pigmented than the other holos. I used two coats plus top coat. "Thistle Be The Day" - A pastel lilac linear holographic. I've never seen a linear holo polish quite this pastel! It's super pretty! I used three coats plus top coat. If you're curious, here's "Thistle Be The Day" on top and KBShimmer "Quick and Flirty" on the bottom. As you can tell, they're quite different! I can't wait to do a full manicure using both of these together. "Meow or Never" - A white (slightly grey) crelly base filled with lilac, lavender, baby blue, and periwinkle glitters in several sizes as well as some tiny holographic glitters. My photos show three thin coats. This is the best kind of formula for a crelly... easy to build up, but not so thick that it covers up the delicate glitters. "I'm So Sweet Pea" - A purpley-grey crelly base filled with white, grey, pale pink, purple, and teal hexes in several sizes. Another perfect formula on this one. I used three coats plus top coat. The base color and glitter mix on this one is SO unique! 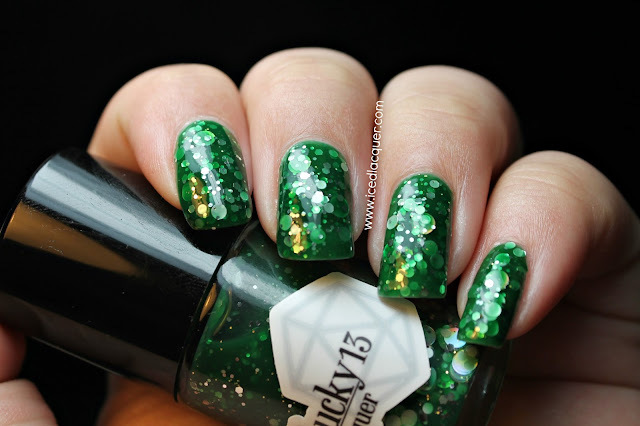 This is my surprise favorite from the glitters in this collection! "Wind Swarm" - A baby blue crelly base filled with white, holographic gold, purple, and magenta glitters, purple squares, magenta dots, and lots of fine holographic glitters. Great formula on this one too. I used three thin coats plus top coat. "Funky Cold Patina" - A bright turquoise crelly base filled with copper, aqua, magenta, and purple glitters. I used two coats for this plus top coat. It was a little thicker than the others, but nothing too difficult. This one almost reminds me of a brightly speckled robin's egg! My opinion: I'm really happy with this collection! I only have nine of the twelve shades, but these are all shades I could honestly see myself wearing. I love the addition of the white creme to Christy's lineup. I looove the holographics, but part of me loves the flakes in "Blush Money" so much that I wish they all had them! 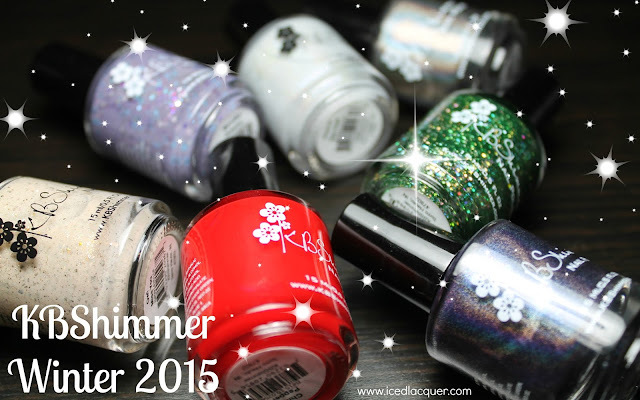 Linear holo plus shimmering flakes... it would be the best of both worlds. "Iris and Sprouts" is so interesting because the linear holo makes it bright and vibrant, but the shade of green is pale and soft. The two white/grey crellies remind me of flowers poking through a layer of snow. In fact, all four of the crellies perfectly represent that transition between winter and spring to me. Honestly this whole collection is absolutely getting me ready for Spring! 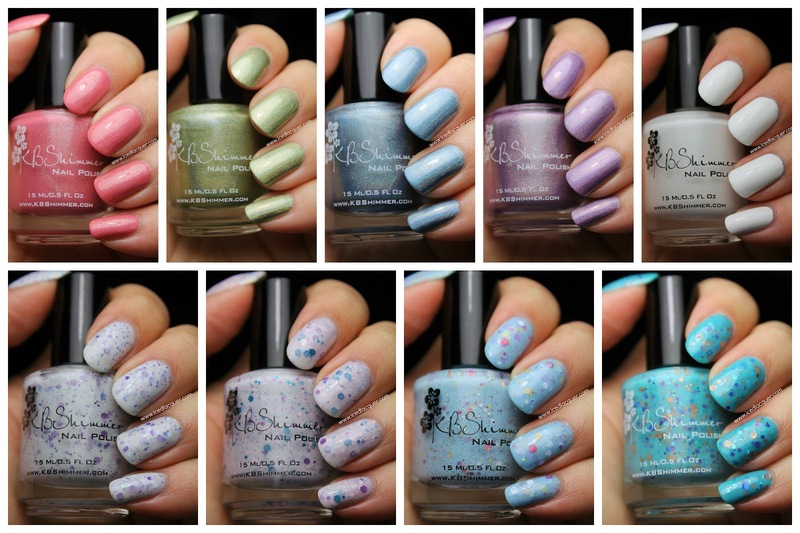 Other details: In addition, the spring collection also includes a bunch of new nail vinyl designs! I have a couple of those to show you in a post later this week. So do you have any favorite shades? Will you be picking any up? Thistle Be The Day and Meow or Never are fantastic! Thistle Be the Day totally surprised me. How can something be so pastel but still such a linear holo?! Great photos. Love Thistle be the Day. Thanks for the compare. Must get the white. Meow and Sweet Pea are so similar - difficult to choose. Thanks for showing them in different lights and next to each other. Can definitely see the lavender hue in your photos. Thank you! I'm glad you like the photos and comparison.